The O2 Academy in Islington may be located within the N1 Centre but that doesn't make its live music any less credible. It's not as spit and sawdust as some of North London's live music venues but that's not always a bad thing. Do you work at O2 Academy Islington? What did you think of O2 Academy Islington? I played a gig here recently and after all the hype and ticket sales pressure i have to admit i was a bit dissapointed. The room was uncomfortably cold (alot of people had to keep their coats on during the night! ), there was nowhere to sit down, no re-admittance in if you need to go out for a cigarette with abrupt doormen, the bar was overpriced and understaffed and the bill of acts was completely random, however the were two dressing rooms backstage where we could get ready and keep all our equipment safe. I wouldn't completely avoid it but i wouldn't get your hopes up either! I played a gig here recently and after all the hype and ticket sales pressure i have to admit i was a bit dissapointed. The room was uncomfortably cold (alot of people had to keep their coats on during the night! ), there was nowhere to sit down, no re-admittance in if you need to go out for a cigarette, the bar was overpriced and understaffed and the bill of acts was completely random, however the were two dressing rooms backstage where we could get ready and keep all our equipment safe. An intimate Islington venue perfect for peering at rock stars and dancing to top DJs until the early hours. A sticky floor, cheap beer and a sharp sound system make this an indoor, year-round festival-like find. A few minutes walk from Angel Tube station could see you in gig heaven. 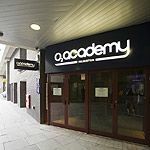 The O2 Academy Islington with its maximum capacity of 800, is not as impressive or grand as its flagship family member The O2 Academy Brixton (which holds a whopping 4,921 party people). It has a small, almost hidden entrance within the N1 Centre that leads you to an arena that, although modestly-sized, has hosted a huge amount of moshing. However, the lack of space is easily made up for by the novelty of being able to see the main stage action from almost anywhere you stand. Even the Mezzanine Bar overlooks the main stage and dancefloor so you can watch ravers bubbling whilst the bartender pulls you a beer, or see the singer throw his scarf into the crowd as you slurp a sneaky shot. As the O2 Academy was purpose-built for gigs and club nights both of these genres benefit hugely from the refurbishments that were made to what was once The Marquee. The sound systems and lighting are good enough to have pleased Craig David, Eminem, Muse, The Cure and countless clubbers since 2003 and look set to continue helping the venue in defining a decade of decent but delightfully-dingy performance spaces. Having hosted a whole range of acts, events and club nights the staff are laid back, polite and pretty damn perky! The size of the venue generates a genuine feel good atmosphere amongst the clientele. Expect to leave having a few new names to find on Facebook. Anything goes at the O2 Academy. From hard rock to soft soul via rowdy rap and thumping drum and bass, check ahead for full listings. There are often good deals on drinks at the O2 Academy, but even if you miss out on those, your wallet won’t be too wounded with beer costing £3, wine £3.35 and a spirit and mixer averaging £4. Don’t expect premium brands, however, this place is all about the music. Leaving the generic luxury of gentrified Islington behind, the basic design of the O2 Academy leaves you free to concentrate on what it is you came for – the music.